Verbal vs. Communicative...why communication is key for Momma's like me! Yesterday it was Disney Day at school. As the kids prepared, I talked to Seraphina about the day and what it had in store. Though I wanted her to wear her Belle dress, she wanted nothing to do with it. Though she finds it beautiful I haven't been successful in getting it on her and having her keep it on. With that in mind, I tossed it in her backpack and put her in a Minnie Mouse T-Shirt. The soft "Lucky Minnie" shirt has become a favorite since I bought it for her last St. Patrick's Day. I watched Facebook for posts on the kiddos and their day and though I saw nothing, I figured I could try to get her to tell me if she had in fact worn the beautiful gown from one of my closest friends. She got off the bus and crawled into her seat. Her sisters buckled her in and I began to probe her asking if she had in fact worn her dress. She said "no". I asked if she tried it on. Again, she said no. This morning as I rubbed my bleary eyes, I saw I was tagged on our PTA page. There, unbeknownst to myself or her sibling who attend the same school, she stood, by her teacher and a friend donning the gown I had packed. Teary eyed, I felt sincere joy knowing that even if she just participated for a little bit, she put that dress on. She wore it for a photo and she had in fact participated. Three years ago, my child headed into a school that I hadn't ever set foot in. I hadn't seen her classroom or really met anyone that would be involved in her daily learning yet I sent her off, scared on a bus with complete strangers. First, they had no car seat. Lucky for me, I called the school and the bus driver made sure to have her in one on the way home. It was in fact in her IEP that I had requested it and it was the first small blip in communication. From that day on, we have continually had to be very honest with the fact that communication is key for me. Another incident that occurred was when a teacher was absent for multiple days. It hadn't been noted and for days my child kept saying "no, so and so". As the days passed I began to worry that she in fact was being harmed and though I wanted to believe the best, I didn't know anyone well enough to trust and so, I worried. Once again, I contacted the school and was told in fact the teacher was absent and would be for a week. Whew. Communication still isn't where I want it and honestly, this is why. My child is verbal so often I think that those around her expect she can share her day to day life, what she experiences and how she feels but the fact of the matter is, she's verbal but non-communicative. Its a difficult position to be in as her language skills are actually adequate but her processing and expression is that of a toddler and so, unless I am told, I never know. Here are three tips for teachers who have not walked in our shoes...yes, that means those who do not have a child with limited verbal skills and children who have special needs. 1. If this was your child, is it enough? If a teacher slips on that "mom hat" and looks at their communication sheet, is it enough? Have they in fact covered everything they would want to see if it was their child. When I communicate to my teachers and therapists, I try to share as much as I can to make it the best situation for everyone involved. So if it is everything YOU would want to know, then its enough, if not? Its time to change. I know that rules are such that teachers are in a sticky place. Paraprofessionals can no longer write notes as they once could and the number of children per class has increased due to the increase in number of diagnosed children. No time to write? Feel free to use the phone. I would rather have an afterthought, a conversation, explanation than be left to wonder and yes, you can text too...though I know its frowned upon. 3. The More You Know. Many parents with kiddos in my shoes feel a lack of trust. I won't lie, I still struggle almost daily with trusting the team that surrounds my daughter most of her waking hours. The more I am told, the more open, the more I will begin to trust. I know that often teachers are concerned to share too much due to the potential backlash but I promise you, the more a parent trusts, the better the relationship can be. Often when a child is diagnosed, many are told to "play the game". For me, I don't want a game, I want a relationship that will help my child find success and in the long run, success for you too. I am glad that my child wore her dress yesterday. I just wish I had known. Had I known when she got home or even at the moment it happened, it may have made our day better. My daughter had a very difficult afternoon and had I known that little spot of sunshine, those challenging moments may have had less of an impact on us as we could celebrated the small steps. I’m sitting quietly in a dark hallway. I am going over everything that has happened today from people, whom I don’t know sending me links to “heal” my child to the way I felt when it seemed I had the house in one piece before the kids came home, before ABA, before dinner. I’m sitting quietly because if I move, my five-year-old will get up and try to get out. She’ll tell me about campfires and sleeping outside and roasting marshmallows over an open fire pit, all because ONE time nearly two years ago, we did that. Chances are she’ll get up a number of times tonight. She’s done it nearly every night for the last 3 years and chances are that she will ask about that camping trip—again. Hopefully though, she won’t try to navigate the stairs into the dark abyss of the New Jersey night. This life, the one we are living is different and as I sat, I scrolled. There again, another post about bringing a child back from autism. A message from a mother who had a child who was “once” autistic? And then, I read the January heading for Finding Cooper’s Voice. New Year’s Resolutions. I’d like to say my word of the year was positivity. I’m trying, I am but I have raised my voice twice already and its January 2. I have five kids, what was I thinking? I’d love for it to be purpose because I honestly don’t always understand exactly why I was put on this path and what my purpose is. Instead, this year my New Year’s Resolution is “protection”. Why? For the past 3 years, I have been living trying to figure out this disability. I’ve tried to make it less severe calling it “high-functioning”. I have tried to “heal” it buying more supplements and serum’s than I would like to admit. I’ve missed out on so much of my other children because I was fighting for insurance (which we finally got) and I have been running my child’s ABA while said insurance was unattainable. So, this year? My word is protection. First, I need to protect my marriage. Autism has taken much of it away. Sure, I love my husband, I even like him. We have been through so much. We’ve grown up together but our marriage is now all about autism. There are no hopes, dreams or wishes for our future because honestly, I see it as caregivers, until the day we die and even while living we have to plan for after those days, so I need to protect my marriage. Second, myself. Recently I read the statement that someone spread too thin looks amazing to someone on the outside but those living it and with the person living for it are most impacted and most hurt by the choices said person makes. I am that person. Perhaps if I immerse myself in everything autism, everything school, everything volunteer, this shadow, this darkness, this sadness, will go away. It hasn’t and so this year, I choose protection. For myself. Time to find myself, who I was before this path veered a different direction and most likely who I still am under the layers of pain (mostly hidden as calories or wine). Third, my faith. I need to protect it. It is easy to say “why me”? Its easy to believe that this is karma for being a bratty kid but reality is that this path, though unlike any I ever anticipated is mine and I can’t do it alone. I’ve always had a strong faith and now isn’t the time to give up..in fact, this year I plan to give in, to permanently place my favorite verse on my body. Without faith, for me, I am empty and though my faith has wavered in the last few years, its still there. I am still called back to church, confession, bible reading and learning more about the struggles each person carries along the road chosen for them. Fourth, my children. They need me. All of them, not just my sweet child with autism, all my children deserve me, wholly. So, I will give of myself to them. Not depleted but part of me for each of their own unique talents and gifts and if it means stepping out, without their sister, I will do so as they are just as important as she and they have all become who they are because of the diagnosis she has. Finally, my daughter. Its no doubt that I will protect her. We’ve all seen those Mama Bear Stickers, Shirts, Blankets, Key Chains with the puzzle piece reminding us that we are their voice, their wisdom, often their security. I won’t forget my daughter but I will learn that protection can come even when I am protecting the rest of us to achieve a better life for us all. When I sat down to start thinking about 2019, words flew into my heart at break neck speed but as I lay awake one night the word I kept hearing was protection. How important it is to protect ourselves on this journey for though the burden may be heavy we have so many ways to make it lighter. May you find the same peace, strength and hope for the coming year and may your word bring you to a place of comfort and joy. Yesterday, I laid in bed going over works for our school Spelling Bee with my second oldest. As she studied and practiced I corrected and commented. I don't take these moments for granted. I know that there are only a few more opportunities for me to do this with her, with her sister and with her two siblings beneath her. I don't know if I will ever have the chance with Seraphina and so I take it seriously. These special gifts that are just time. Together. Working for a goal that my child wants to achieve and know she wants to achieve. As we loaded up into the car, I knew that I was becoming more nervous than the child sitting in the "hot" seat. She seemed as cool as a cucumber and told me there was nothing more she could do and win or lose, she studied and did what she could. Inside, I hoped she would do well but also felt she didn't study enough. School never came easy for me so her "studying" would have been a blip on my radar if I had any hope of success. Inside, the fluorescent lights highlighted the make shift area where the children would be quizzed. I remembered it from last year and though it was the same, I felt different. Perhaps I was more aware of this gift, the time to watch my child do her best because I know that in the future it may not happen. As I shook, this little face peered back at me and I knew she felt good. Still, I sat with baited breath as the words were read. I would think every parent with a participant felt the same way. In the beginning I thought we may be sleeping at the school and talking to others, they felt the same way. The children were amazing. Their poise and ability to work under pressure truly impressed and amazed me. It was apparent to me, that like myself, each parent in that room was happy for their children and also wanted the best for each of the other children there. I was grateful to that chair who worked tirelessly creating a simple environment that allowed for the kids to showcase their ability to spell words that some adults cannot. The night continued and I giggled as my heart rate went from 70-155 and back again as the children stepped up to state their name, teacher and of course the spelling of their word. As the night drew to a close, I watched as the final three contestants were my child, one of her best friends and our goddaughter. That moment being able to be present to with my child, and two that I love was a gift. I acknowledge it and I won't lie, I truly felt blessed to witness my Godchild as my other Godchildren live so far away. As "abolition" was announced, I knew for Cecily that the contest was over yet instead of disappointment, I was excited to watch her friends continue on in the journey. The two final contestants went head to head for what seemed like an eternity and then finally, it was over. Everyone was impressed and proud. Everyone was in awe and honestly, I was elated. For the kids that competed. All of them. It was a moment that I may not have celebrated before my child Seraphina was born because my sweet Serrie has changed our lives forever. Each "little" moment is one that we cherish because it is something that we don't take for granted and each of her small moments we celebrate as well. As each child received their certificate, it was obvious the entire room swelled with joy. Each participant had grown through the experience, from the classroom bees to the final school bee. What was even more special was witnessing it with a room full of educators. I am certain that these teachers were not MANDATED to be there and some stayed or traveled back from Pennsylvania but they too celebrated with their students. They cheered for each child when they found success and felt that twinge of disappointment as their students also found disappointment. Truly, I have rarely found educators that measure up to my mom, but here, I have and last night, after celebrating with the Sweet 16, the children found their teachers, some from present years and others from past and were able to celebrate with them as well. Truly the win wasn't just the students or the families, but the school, the teachers and the entire community as our district has built a community of educators that not only work in education but live life long love and education. Oh, and at the beginning I mentioned that I didn't deserve my child. I suppose that I should explain. You see, this child, is humble. She has humility that is not taught, its simply embodied in her existence. As we rode home, I told her how proud of her I was. She said "there is no one I would rather lose to.". Um, what? I wish I had that ability to be aware of my own strengths and weaknesses. She is truly wise beyond her 11 years. Thank you God for giving me each of these experiences to live, love and learn. I am grateful for each good moment, the struggles and of course the opportunity to learn not just as a parent but a student of my own children. Cecily with her very favorite teacher ever. Behind that little face, the one that smiles for the camera on command, that challenges us and brings us joy is a team made up of so many that her little life could not be where it is without them. For nearly 3 years, I have spent time trying to figure out just what was different, how to change the differences and now finally, how to live with the different path we are walking on. I've had blogs, probably 10 of them that go up and down when people make comments or judgement and reality is, that person who wrote before is growing to like exactly who this journey is making her become. You see, behind our beautiful child's face is a group of people who live with her challenges and her successes each day as she progresses and moves forward developing in life at HER pace. This year, this blog is taking a bit of a detour, it will of course share the journey we travel, the life we live with having a child with a disability but its also going to focus on the rest of us...well, maybe not dad. He's shy. Truth is, we have all been lost, behind the face that screams AUTISM and truth is that autism is just a single part of the little love whom we have all learned from. So bear with me as I begin to process where we have gone, where our hearts have broken and just how I hope to rebuild them. Everyone seems to be coming up with words for their year. For me, this year its protection. Protecting each of my children. When they need it, where they need it. Protecting my husband (in case you didn't know, I wear the pants in the family--and he will admit it). Protecting our marriage because gosh, we have been through so much. We grew up together, traveled many dark paths and truly still like each other...MOST of the time. Protecting myself because honestly, I'm enough. I am worth it and I deserve it because as I recently read spreading yourself thin looks good but only hurts yourself and those you care about most. So, if this blog becomes sparse, its not because I don't want to write. I am writing. Perhaps just not here. 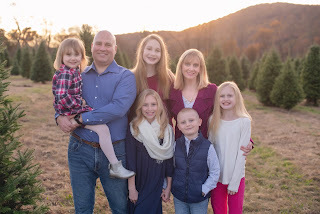 If this blog shares more about the other kids, that is okay too because this little love is their sibling too and these amazing kids have been transformed because their lives have changed because of her. If this blog becomes dull and boring, feel free to leave. Its okay because in the end we all have to protect ourselves and give our family the most of who we are. To 2019. This year is going to be a great year, I can feel it already.